Day 30 – Brittany F.
Having a bad hair day, I made an appointment at Lavish, a salon in Webster referred by my sister, Susan. I didn’t plan to give my $10 kindness investment to anyone there, but after talking to colorist Brittany F., I felt she was “the one.” When she asked what she could do for me today, I told her I wanted long hair like hers and I wanted to be as thin as she was. “Sorry, can’t help with either of those requests,” she laughed, “but I promise to make your color look great!” Sounded good to me. I told Brittany about Reed’s Year of Giving projects and about being an unemployed Kindness Investor. She was very interested and thought it was a cool idea. She happily accepted my $10 investment and started work on my hair. Brittany is 20 years old and originally from Canada. Her father’s job brought the family to Texas; first Corpus Christi, then to Friendswood, just south of Houston. It turns out Brittany attended the same high school in Friendswood that my nieces Lauren and Allison attended, though they had graduated by the time she entered high school. In her spare time, Brittany loves to travel and swim. She and her boyfriend, Kevin, met in high school and have been dating about six years. She has three dogs; a golden retriever named Harley, a brittany spaniel named Cricket and a little “weiner” (dachshund) she calls Weezi. Quote: Live like there’s no tomorrow. “Cute car,” I said. “You look like a VW Beetle owner, Brittany.” Check out her picture – she does! I told her about the Lend a Hand section on Reed’s Year of Giving website. After she thought for a bit, she decided her one wish would be help paying off her student loans. “It would be awesome to be debt free!” she said. You and me both, Brittany! Day 338 – Sarah B.
I’m 10 days away from the 365th recipient. It’s hard to believe. I have met so many amazing individuals through my daily giving as well as through the blog. Letters and comments have poured in day after day giving me telling me how my story has inspired them in some way and offering encouragement to me to make it to the end. That day is now in sight and I find myself reflecting a lot upon the last 12 months. For those of you in the DC area, I hope you will join me on December 14th at Tabaq Bistro which has been so generous in helping make the year-end celebration possible. The festivities get started at 6:30pm. Sarah was worried her bangs were too short. I told her they looked fine...then again I'm not exactly a fashion expert. Sarah is a third-year law student at George Washington University. Her anticipated graduation date is May 11 and after that she said she would like to find a job with the US government. “I had an interview recently with a judge in Alaska, but I turned that down – it’s just too far away.” She said she really enjoyed contract law, “and the government has contracts for everything.” Then her mind must have slipped back a few hours to happy hour, “maybe I could practice wine law?” Sounds interesting. She wasn’t sure what she was going to do with the money. “If this was money I had earned through work,” she started to say, “I’d probably just use it on food , maybe buy lunch with it, but since this came in such a unique and unexpected way, I feel as if I should do something different with it.” I followed up with her this week but haven’t heard from her yet. I have some other notes that say something about blue grass music and fiddles…but like so many other times, I can’t read my scribbles weeks later when I write up the blogs! That's the Brewmasters' Castle in the background. Sarah was so nice. She is one of so many people that I have met through the Year of Giving who I’d like to be able to call my friend. And we’re practically neighbors. She lives a block or two away. Sarah will be missing the year-end celebration unless she changes her holiday travel plans. She’s got a ticket to Houston, TX on the 13th. Two quick updates! I have finally got some video together from my first delivery of items for Tommy from Day 155. You can see the video here. He was so thankful! Thanks to all who continue to send items for those on the Lend a Hand list. Also, I recovered some video for Alex on Day 180 and posted it. On Day 190, I went out to Dulles to meet up with my friend Alex for coffee. He did his MBA at Vanderbilt with some friends of mine a few years ago and had a long layover at the airport on his way back from the west coast to Europe. It was a short visit, but always good to catch up with old friends. He keeps telling me that I should come to see him in Riga, Latvia…it would be fun and interesting to see how Latvians respond to the Year of Giving! Later I found myself sitting in Tina’s chair at the Hair Cuttery at Connecticut and R in NW. I have had this idea before to give my $10 to the person that cuts my hair. Since you sit there and talk to them for a good while, I have always thought that they make for a perfect person to meet and give $10 to. I have tried a few times, Day 60 for example, but have not been successful yet. I wasn’t sure until the end of my hair cut when she actually took my $10 if she would participate or not. She seemed a bit hesitant the entire time, but I did learn a little bit about her…but not much. She seems to be a pretty private person. Born in Addis Ababa, Ethiopia, she moved here some 30+ years ago after meeting an American man. She has been working at the Dupont Hair Cuttery for about 15 years. 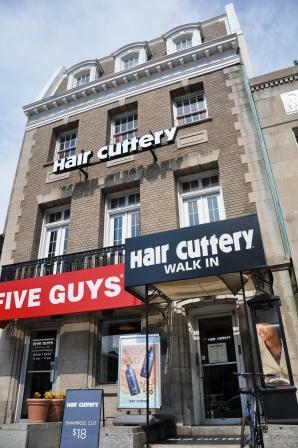 By the way, if you live downtown this is one of the most economical places to get your hair cut. 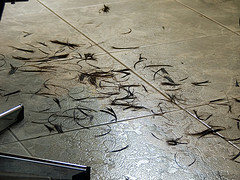 For men, cuts are $18. Depending on where you live, this might not sound like a good deal, but almost everywhere else here charges more than $30. I have always had good experiences there and I always get a different person. I asked her what was the craziest hair cut she has ever given. Wouldn’t you know it, she said the “M” word….yeah, I won’t write the word, I already get hundreds of people every day coming to my website looking for this type of hairstyle. See this post/comments to learn more about this odd relationship the website has with people surfing for these kinds of haircuts. Tina didn’t tell me much more (and I definitely wasn’t allowed to take her picture!) We talked about the weather and trivial things like that. I did learn that she likes Sci-Fi movies and has always wondered if there was intelligent life in another universe. I believe that there is. She finished up, I gave her the $10 which she plans to pass along, paid the bill, tipped her and went on my way. A question for you readers. I am writing an article about giving and whether intentions matter. What do you think? Does it matter what someone’s intentions are when they practice giving? I would love to hear your thoughts on this. 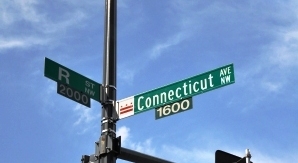 The Hair Cuttery in Dupont is located at 1645 Connecticut Avenue, NW, Washington, DC 20009-1054 – (202) 232-9685. Open Weekdays 9am-9pm; Sat 9am-7pm; Sun 11am-5pm. Walk-ins welcome.